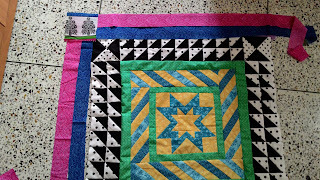 Last March-April, there was (mini) round robin swap in my facebook quilting group Desi Quilting. 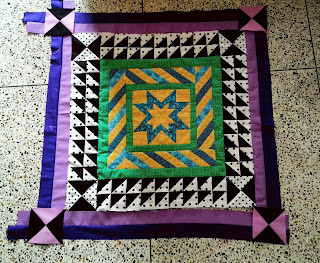 My partner,Prabha, sent me this pretty star block in blue, green and yellow. Especially after seeing what others have done in the group. At that time, then I remember one of Rita's (of RPQ) quilt. She made medallion with black and white. so why not trying using the black and white border, I thought. Afterall black and white is neutral colors, right? but instead of pure white, I decided to use the polkadots and love how it turned out. This the time when understanding color theory in quilting is very IMPORTANT. When you hit a wall, just open that color wheel and go from there. I just consult the color wheel, and decided what's best from my stash. though I admit that I was using different weight of cotton there. It is one of the problem here in India, most cottons have different weight. 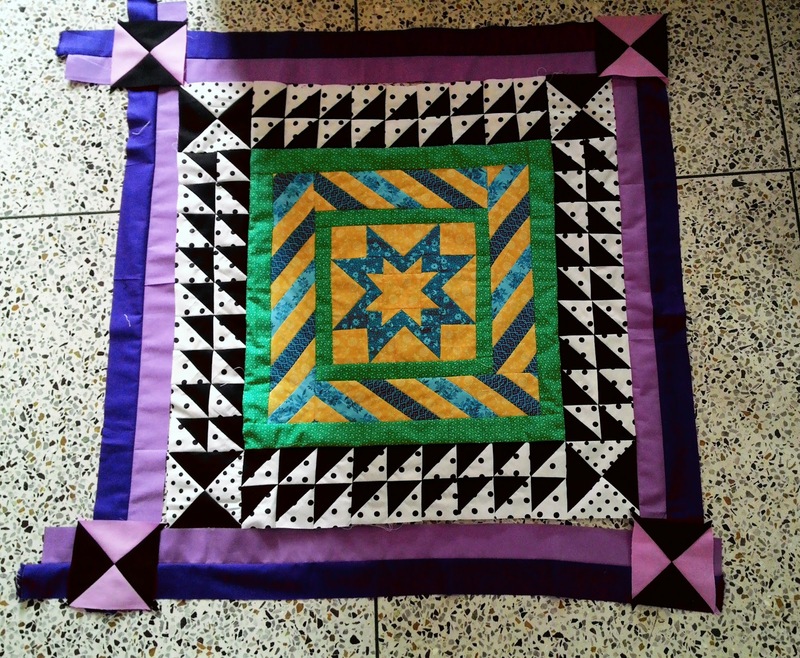 it's very tricky, but hey..there's no rule in quilting rite? Pardon the graffiti on the swing..
that was the sons doing when they were on crafty mood. 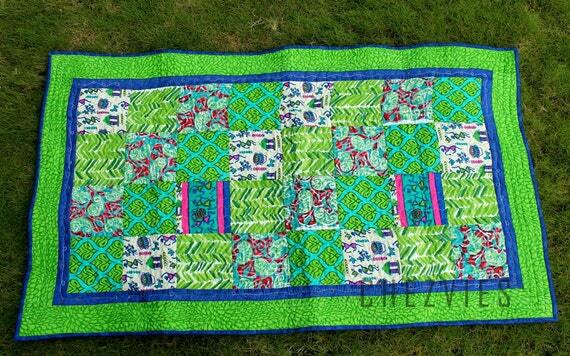 Actually I planned a different quilt and then decided to change it midway using completely different fabrics. This one sort of grow from 40" x 40" to 48" x 60" which is - I think - its great for 2 years old. 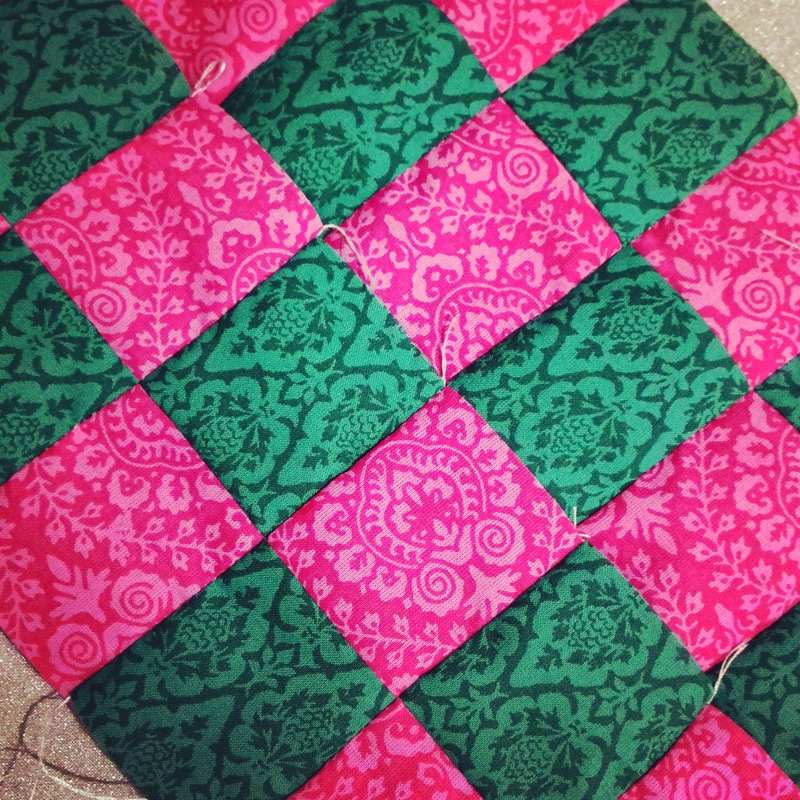 I decided to do straight line quilting using mercerised variegated cotton but it kept breaking. It turned out the thread was old (2009 made) which I didn't check. Lesson learnt. So, after struggling for few lines I decided to change the thread. Too bad, cos I love the color so much. Well, its not meant to be. Another thing was I NEED walking foot. 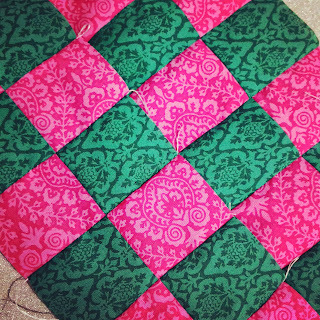 I'm not (yet) comfortable with FMQ -ing big quilt and I love straight line quilting after browsing Pinterest. 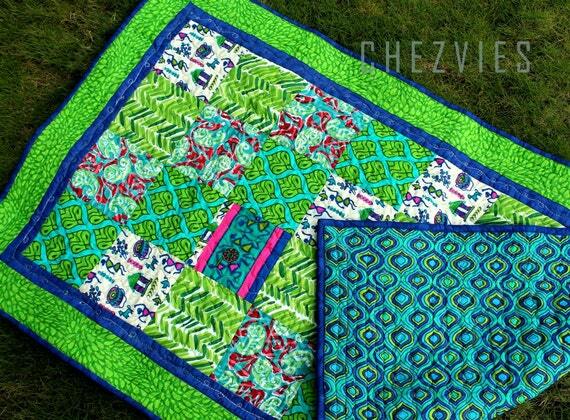 There's just so much you can do with straight line quilting. HERE is one that I love. And to do that I need the right tool. I'll be getting one soon, thanks to my dear friend who will get it for me ...yay!! It's packed and ready to send by Monday. It's been raining for the last 2 weeks, though the weather become more tolerable but the lawn become muddy. Luckily the rain always comes at night, at least we get to see the sunshine during the day. And the flowers have gone bad to my MIL's dismay. But I love rainy season, cos even though it's humid at least the garden is greener. and who doesn't love green? Yes, I finally completed this one. Simple table runner using charms and a slim blue border make it more charming. 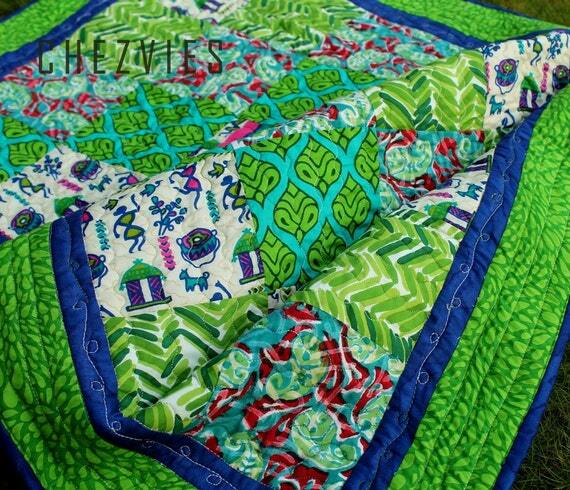 I love the feel of mulmul cotton in quilt. It's so soft. it's challenging to work with cos it's stretchy, maybe I should use more starch next time I work with mulmul. I wanted to make the quilt when her baby was born but then you know....it's got delayed. I washed and ironed it today and will take a proper pics tomorrow and hopefully will write a blog post about it.